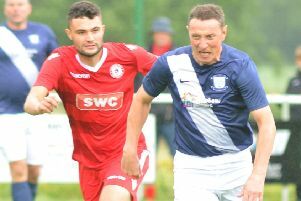 Longridge Town boss Lee Ashcroft wants his players to justify their praise this season by winning the Hallmark Security League’s First Division North title. Town are six points clear at the top with 11 games of their season remaining, having looked well set to finish top. However, second-placed Avro have taken 39 points from the last 45 and, if they win their two games in hand, they would go level with Town. Much, then, seems to depend on the previously postponed game between Town and Avro, which has been rearranged for Wednesday, February 27 (7.45pm). “They are absolutely flying,” Ashcroft acknowledged of his side’s nearest challengers. “Saturday’s draw against AFC Blackpool was a setback and we have 11 cup finals coming up, some of them very difficult games. “It’s the same for Avro as well but this is the situation you want to be in, it’s absolutely brilliant to be where we are. Weather permitting, Town are due for a return to action on Saturday when they host Atherton LR. The two sides met in October with Ashcroft’s players running out 6-0 winners. A repeat would do them nicely this weekend as they bid to bounce back from last Saturday’s 1-1 stalemate at AFC Blackpool. The Mechanics might be 14th in the table but it was the second time they have drawn with Town this season. “They are very good and they are well organised,” Ashcroft said. “They were the better side in the first half but we got the goal just before half-time and that seemed to settle us down.